One of the only things that everyone has in common is a raw attraction to other human beings, a need to feel close to someone; yet, how we experience this and what learn from it is so vastly different. We have a fascinating affinity for boxes and labels surrounding love that are both universal and person specific. Using this 25 + hours of raw interview material, the intention is to create a piece that reverberates the core of each of the audience members, producing the writhing roller coaster of emotions felt in relationships, as we break down boxes that cause us to isolate and oversimplify each others' experiences. August 2013- I reached out to my extended network offering a coffee/beer/drink of poison to anyone that would gush to me about every EX/crush/lover/non descriptive romantic partner They'd had since they were still in the sandbox. October 2013- I got together 4 performers each with multidisciplinary skill sets. Together we started weaving the interviews into a piece of theater. 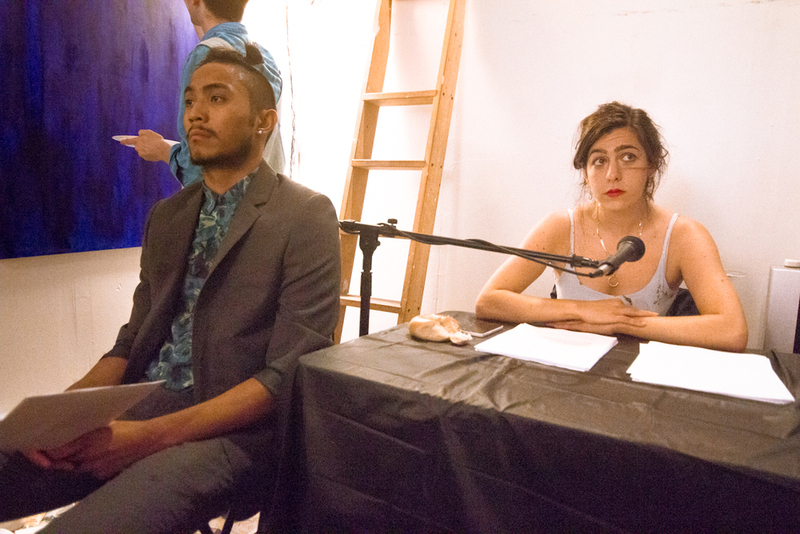 December 9, 2013- We presented the first work in progress event at Cloud City in Williamsburg, Brooklyn. February 2014- Root of the Rosebush is selected as a 2014 Artwerk NYC finalist.